Award-winning photojournalist Jacobus Rentmeester recently filed a petition for writ of certiorari, asking the United States Supreme Court to take up his case against athletic apparel maker Nike Inc. on appeal from the Court of Appeals from the Ninth Circuit. In the petition, filed in early December, Rentmeester asked the nation’s highest court to answer the question of whether copyright protection for a photograph is limited solely to the photographer’s selection and arrangement of unprotected elements—or, rather, that such protection also covers elements of the photograph that express original creative judgments of the photographer. At issue in this case is an iconic image of basketball superstar Michael Jordan captured by Rentmeester in a 1984 photograph shot for Life magazine. The image, which features Jordan in mid-air and flying toward a basketball hoop with his left arm and both legs outstretched, was ranked by Time magazine as one of the most influential images of all time. Many of the visual elements of the photograph were orchestrated by Rentmeester, including an artificial dunk pose inspired by ballet from a previous Rentmeester shoot with Mikhail Baryshnikov and the placement of the basketball in Jordan’s left hand (Jordan was a right-handed dunker). Rentmeester’s photo of Jordan was one of many career highlights—which included a photograph of an American tank commander in Vietnam that in 1967 became the first color photo to win World Press Photo of the Year, and the well-known photo of the Black September terrorist during the Israeli national team hostage crisis at the 1972 Munich Olympics. Nike entered into a sponsorship deal with Jordan around the same time that Life published Rentmeester’s photograph. Nike’s creative director, Peter Moore, requested a license for Rentmeester’s work and Nike quickly violated the license agreement by ordering another photographer to produce a derivative of Rentmeester’s work, which Nike used on posters and billboards. Rentmeester complained to Nike, and the apparel company entered into a second license agreement permitting the use of the derivative photo on posters and billboards in North America only for two years. Rentmeester’s copyright infringement case was filed in 2015 after Nike continued to violate the terms of the second license agreement by reproducing the Jordan photo in a variety of forms. 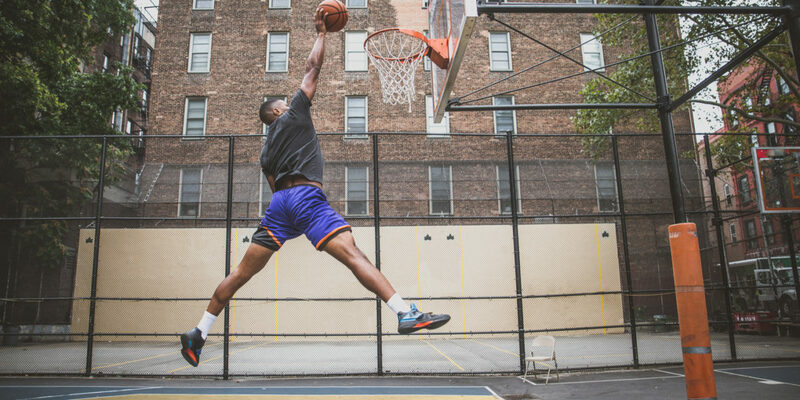 The district court granted Nike’s motion to dismiss, reasoning that “ideas—even very creative ideas—are not granted copyright protection” and then finding that the photograph expressed the “idea” of Jordan dunking in a ballet-inspired pose. The district court was affirmed by a divided Ninth Circuit panel, most of which likened photographs to “factual compilations” such as phonebooks, which are protected only in their arrangement of unprotected materials. On the pleadings alone, the majority panel found that the photographs aren’t substantially similar because the details of the former photograph weren’t replicated by the latter photograph. The Ninth Circuit also denied a rehearing en banc (before all judges of a court) despite a dissenting opinion in the case. Rentmeester argues in his petition that the Ninth Circuit’s decision conflicts with the Supreme Court’s own recognition of the artistry involved in carefully staged photographs leading to copyright protection from more than a century ago. In 1884, SCOTUS decided Burrow-Giles Lithographic Co. v. Sarony, which extended copyright protection to photography. In finding that Burrow-Giles had violated Sarony’s copyright by making unlicensed prints of a Sarony photo depicting Oscar Wilde, the Supreme Court held that Sarony’s photo was a “product of plaintiff’s intellectual invention” rising to the level of a work of art. The Ninth Circuit’s decision also represents a conflict with various other circuit courts, Rentmeester argues. This includes the Second Circuit, which along with the Ninth Circuit is a major forum where copyright cases are decided. In Rogers v. Koons (1992), the Second Circuit determined that artist Jeff Koons infringed upon Art Rogers’s copyright when Koons produced a sculpture depicting many elements of Rogers’ photograph of eight German Shepherd puppies being held by two people sitting on a bench. The Second Circuit found that individual elements selected by the photographer, including a subject’s pose, lighting and camera angle, were protectable elements—directly conflicting with the Ninth Circuit’s decision on such elements being unprotectable. The Second Circuit also denied summary judgment in Mannion v. Coors Brewing Co. (2006), holding that a Coors billboard may have infringed Jonathon Mannion’s copyright in a photo of basketball star Kevin Garnett in which elements of Mannion’s photograph were identified as protectable, including the composition, angle and lighting. “Ultimately, the decision below treats even highly original, carefully-staged elements in a photograph as the equivalent of phone numbers—a pile of preexisting, unchanged facts that can be elevated into creativity only through clever selection and arrangement,” Rentmeester’s petition reads.